Guinness can, yep, I have those. 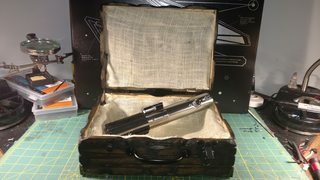 I wanted a Maz Box for this one, not movie accurate, just a box built to look like an old wooden box. 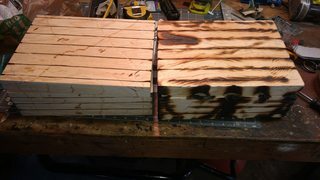 Next, I cut the lines so it looks like planks, then burn, dremel, mar, and scar. FIRE! 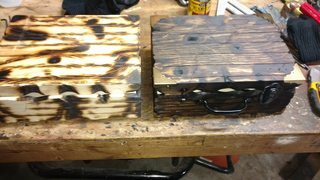 Add Stain, and hardware, and oilah, it looks like an old box that has been in Maz's place for hundreds of years. Lined it with some padding and burlap over padding. Box fit for Maz! Step two: I wanted to do a momentary switch in the clamp on this one. I'm doing another MR Graflex (Rey's Jedi Training Hasbro), and I'm going to give red button activation a whirl on that one. I got rid of the latching switch here. I dremeled out the existing switch hole to allow for the new tactile switch hat to poke up into the clamp. The micro tactile switch was then intalled there under the bubble strip. Got rid of the factory metal underneath the bubble strip, and replaced it with some layers of aluminum beer can trims until I got the appropriate response out of the tactile switch. It took 3 layers of beer can trim. I trimmed the aluminum in a solid rectangle with no slots, so that it prevents the clamp card from sliding forward as it did from the factory with the latching switch. Step three: Prep the conversion kit. 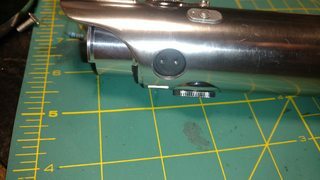 I painted the round recesses flat black where the short graflex pins go. 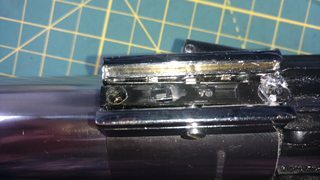 I drilled out the stock MR Electric tabs so that they fit the TCSS Short Graflex Pins, so I could re-install them. 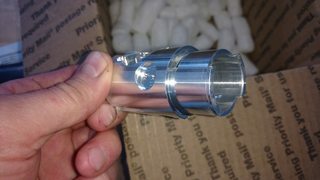 They are chrome, and should be brass, but looks better with them than without. 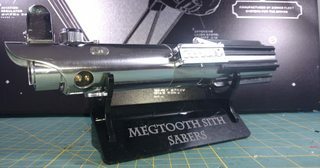 Installed the new LED Star on the heat sink and popped the conversion kit into the saber after de-burring the inside of the saber per Tim's advice. The fit is tight, but accurate. I have no complaints about the conversion kit, none. I think its awesome. 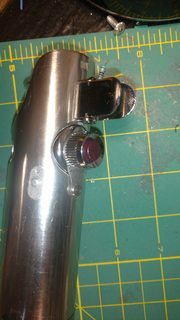 I also drilled and tapped the conversion kit to receive the Graflex 2.5 Red Button and Glass Eye. Threads are 10-24. 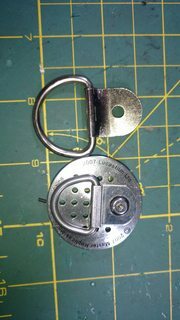 I did have to mill down the base of the red button so that it fit in the button receptacle, but that took a minute. Simple. 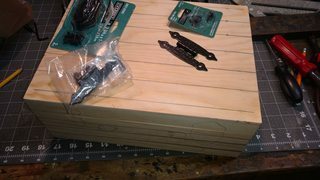 Arrival of the TCSS Conversion Kit! Step four: Prep the MHS V6 chassis. 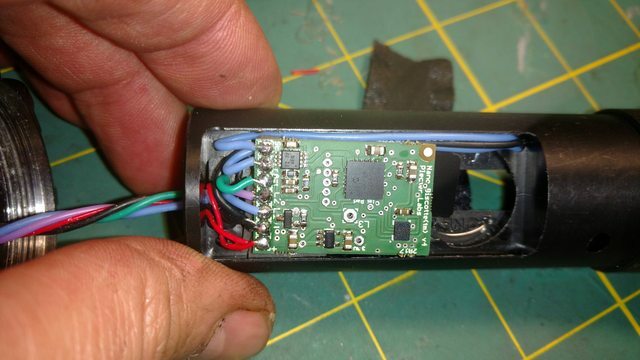 I trimmed the battery holder, wired it, wired the speaker, and attached the NBIV aboard. 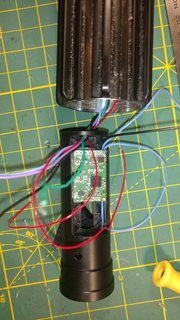 I went ahead and soldered the speaker wires, but left the positives and negatives off until they joined with the wires coming from the saber (LED+ and Switch - will join with battery leads and then onto NBIV). I also cut a piece of T8 tubing and routed the saber wires into the tube, so that the tube could be later slid over the MHS V6 chassis, once the install was complete. Step five: Route the wires into the MHS V6, join where appropriate, and solder in the board! 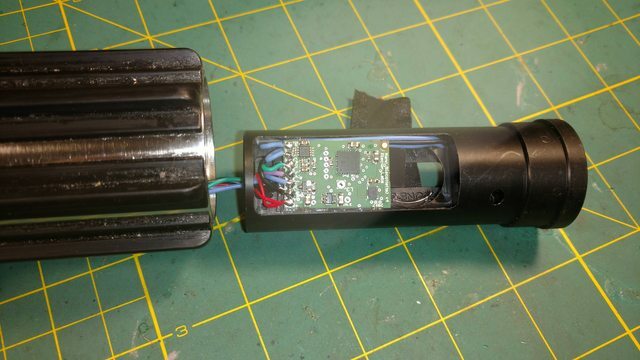 Insert blade (new red button is blade retention!) and rock and roll! Last edited by Tom Tilmon; 03-13-2018 at 09:52 AM. I forgot photos of the guts! I'm really happy with the results and performance. The NBIV is such a neat little board. This saber is pretty loud too, way louder than my 2.0 Installs. You can feel the hums through the hilt! I'm getting ready to convert a Rey Jedi Training from Hasbro as well. I'm going to repeat this process, except for using a Graflex 2.5 Red Button for Activation next time. So the clamp switch will be totally dead. Going to use RB,B,W in that saber too. Other than that, it'll be the same. These conversions are cake, and come out great given what you start with. I still like the hilt kits a bit better for some accuracy stuff, but the MR's are ok for what they are!